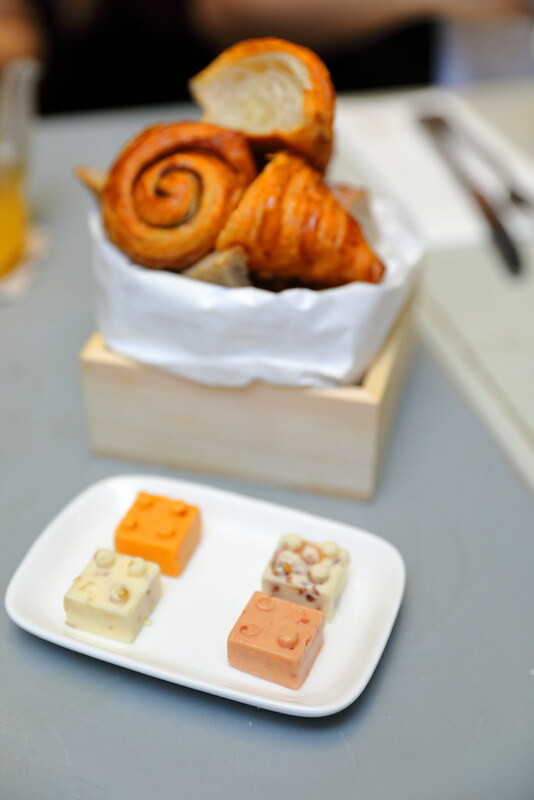 Antoinette well known for its French pastries and sweets have gone local to create a new savoury menu featuring dishes of Chef Pang's Hakka roots, with a European spin to it. We started with the Bread & Butter ($5). In the bread basket, there were satay bacon epi, levain, baguette, five-spice escargot, and croissant. What got me really excited is the accompanying flavoured butters selection. The interesting flavours are Preserved Bean Curd, Caramelized Shallot, Rempah and Preserved Turnips. These flavoured butter has that distinct Asian flavour which is familiar but yet unique in European cuisine. My favourite is the preserved bean curd which I finished the whole block of it. I observed the younger tastebuds seemed to prefer th caramelized shallot more though. Next we had the Chilli Crab Aranicin ($16) which is an Italian dish with a Singapore twist to it. 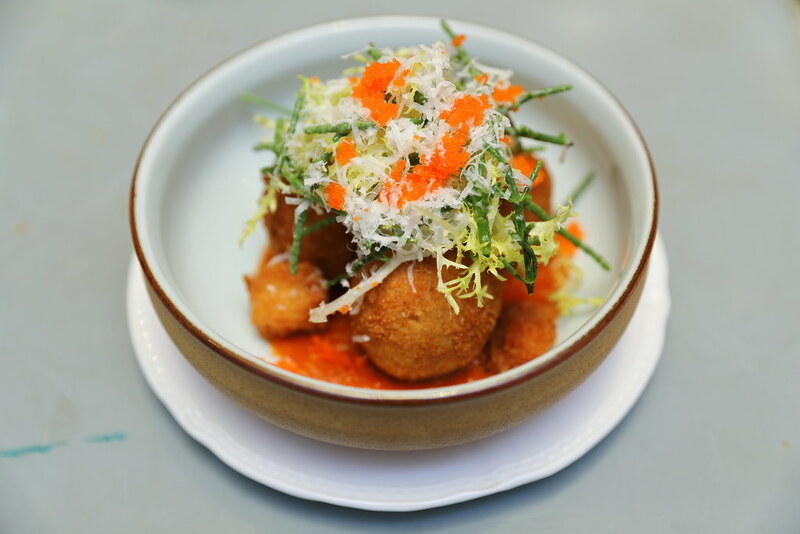 The risotto ball features a homemade chilli crab sauce served with fried Chinese bun and sea asparagus salad. I actually like the cheesy risotto inside the crispy ball over the chilli crab sauce. Italian bruschetta was given a Asian take in the Tuna Mousse ($22). Chef Pang has substituted the use of balsamic vinegar and Italian basil with Chinese vinegar and Thai basil. The Chinese vinegar is quite prominent in the execution lending an enjoyable acidity to the dish. However I find the dish rather expensive for some grilled bread, marinated tomatoes, levain, egg and chips. 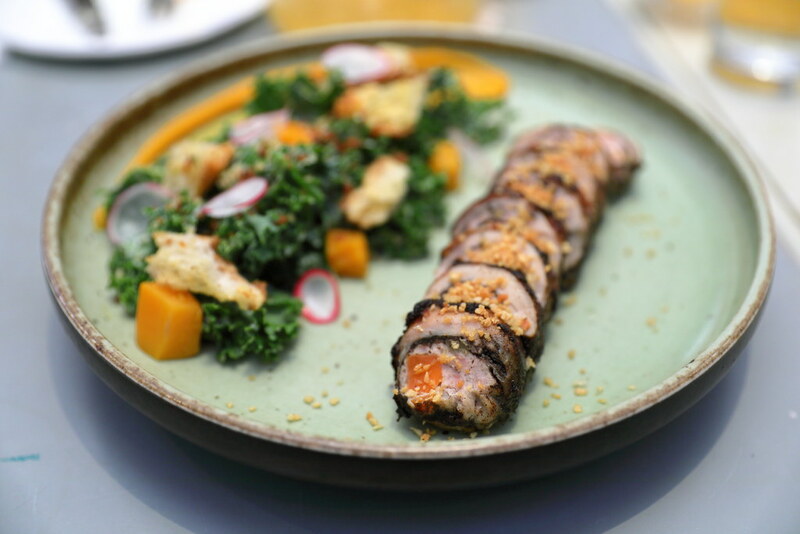 Instead of anchovies, salted fish dressing is paired with the Kale Caesar ($22), together with butternut squash and garlic croutons. 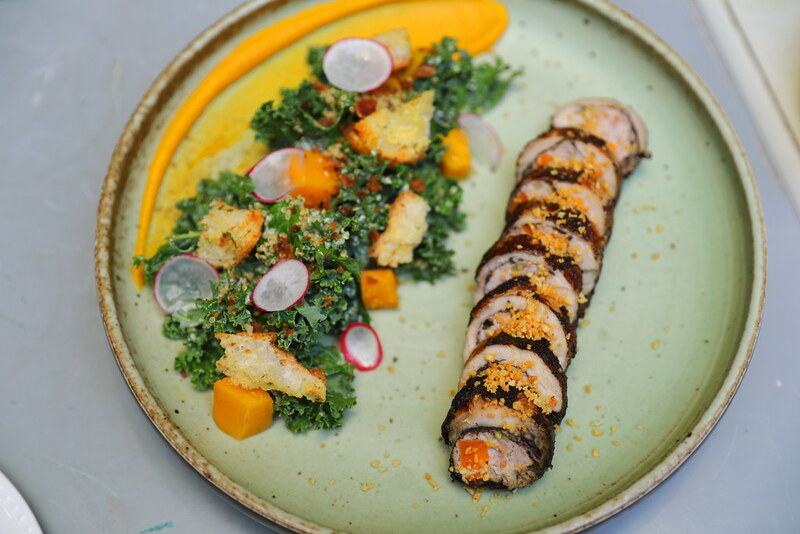 It also comes with roasted five-spice chicken roulade sprinkled with fried garlic. While I applauded the used of salted fish sauce which is interesting not too overpowering, I felt that the chicken was dry. Someone at the table mentioned that it felt like eating ngoh hiang instead. Do not this is usually served with 3 pieces only. We were given more as this is a tasting and there are six of us. 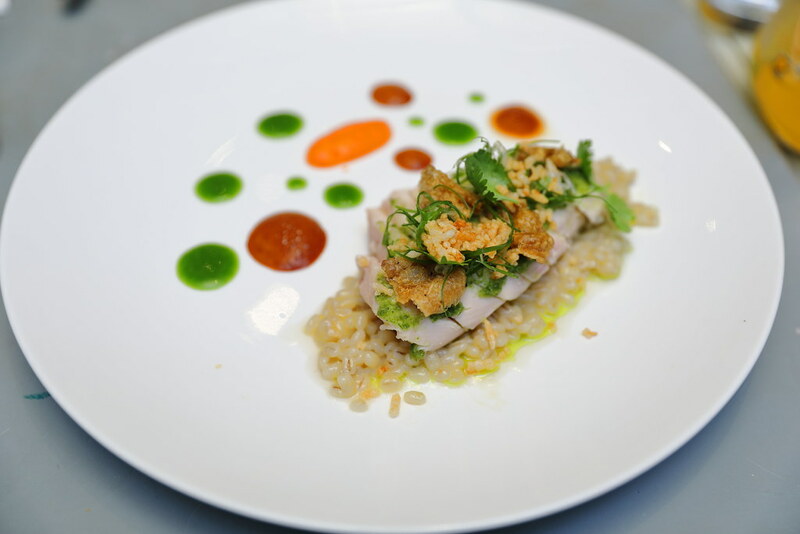 A rendition of the signature Singapore's Hainanese Chicken Rice ($26) by Chef Pang uses sous-vide chicken breast paired with scallion and ginger dressing, chilli gel and dark soya sauce foam. Instead of rice, it is replaced with barley grains cooked with chicken stock and aromatics. I have to say this is a well executed interpretation, getting all the elements and flavours of a chicken rice spot on. I only wish the texture of the barley can be slightly softer. 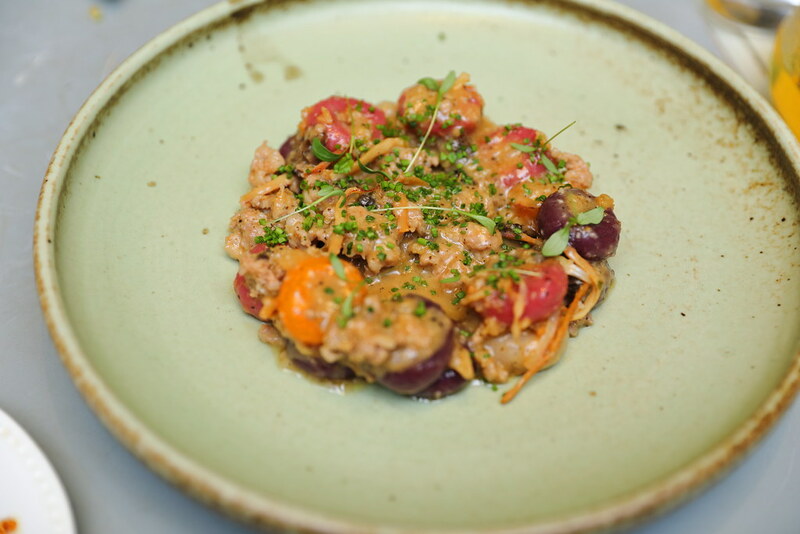 One of my favourite dishes among the new heritage creation is the Hakka Gnocchi ($24). The colourful colors come from beetroot, sweet potato, purple sweet potato and yam. 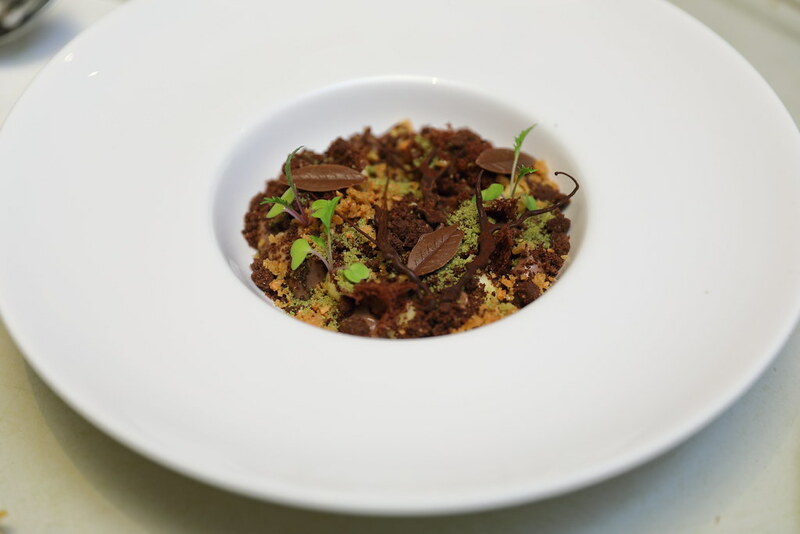 For me the star is the medley of dried shrimps, foie gras, cured pork and morel that held the soft dough dumplings together. 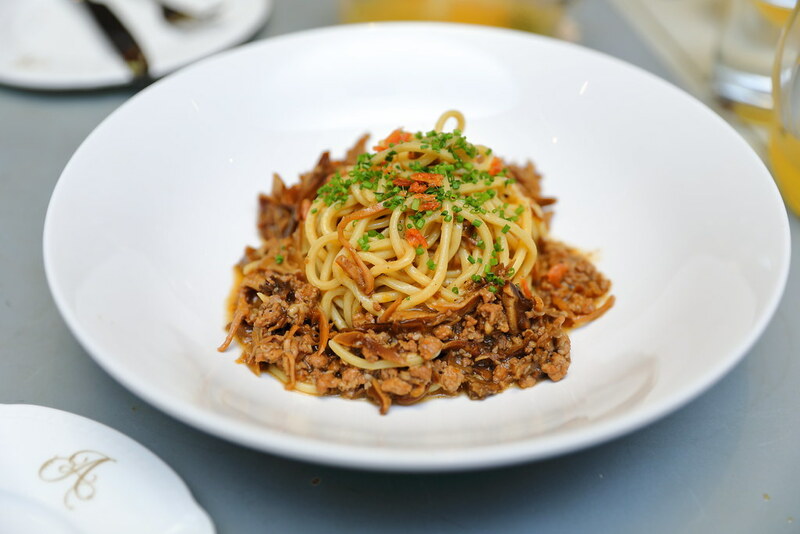 The Spaghetti ($24) knid of resembles a plate of wok fried Chinese noodles. While some of the diners at my table find the texture of the pasta a bit tough, I actually enjoyed the bite to hold the richness of the cuttlefish pork belly ragout and ebi sakura. Moving to the dessert, Chef Pang surprises us with the Sunny Side Up ($10). The dessert comes in the form of a breakfast plate. 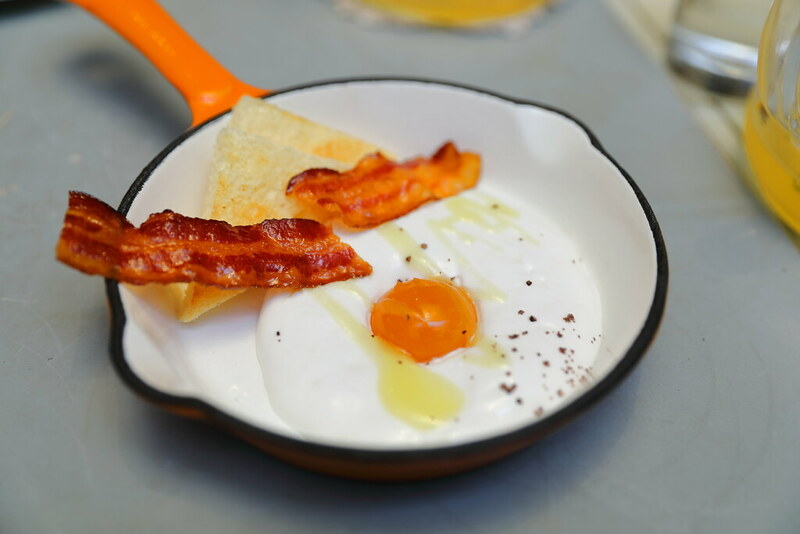 The egg white is made of coconut Malibu foam, and the yolk is actually a mango coulis. Completing the great breakfast are candied bacon and toasted brioche. It is a pretty dish indeed but it fell short of satisfying me as a dessert. 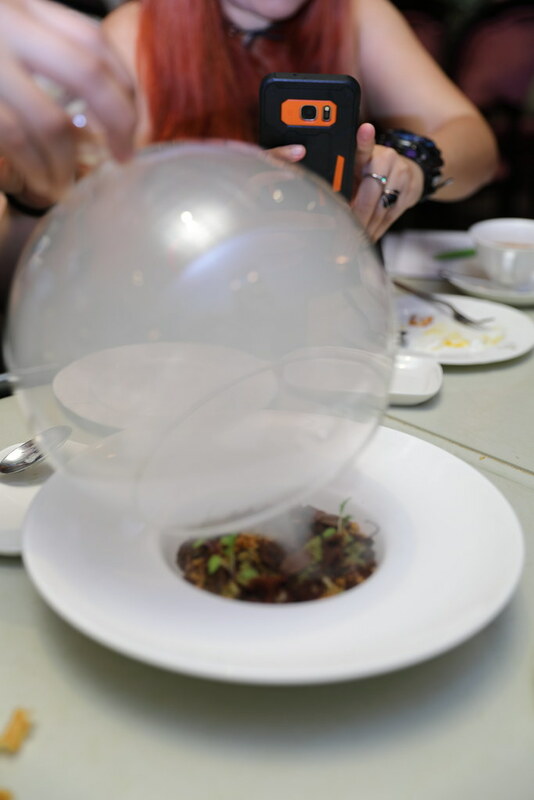 A theatrical dessert is the Misty Forest ($18) that is presented in a bell jar. Putting aside the billowing mist which we found it quite unpleasant, the sky cleared when we dug into the richness of the forest made up of grand cru dark chocolate, cremeux, yuzu curd, praline cream, cashew nut nougatine, chocolate crumble, chocolate coral sponge and matcha moss which married beautifully together. 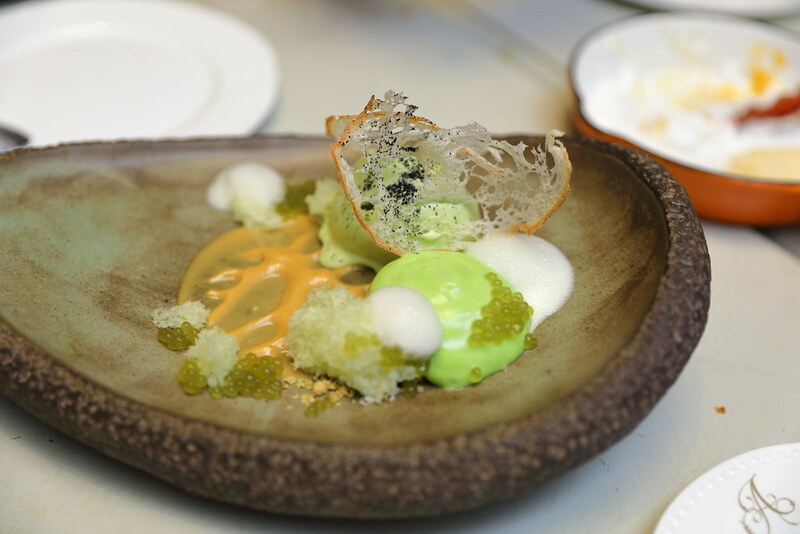 The Pandan ($14) is a dessert served in both cold and hot. For the cold portion, we have pandan ice cream, pandan sphere, gula melaka etc. We felt that the pandan ice cream has a bitter aftertaste. It was explained that the used of fresh pandan to make the ice cream was the reason for the bitterness. 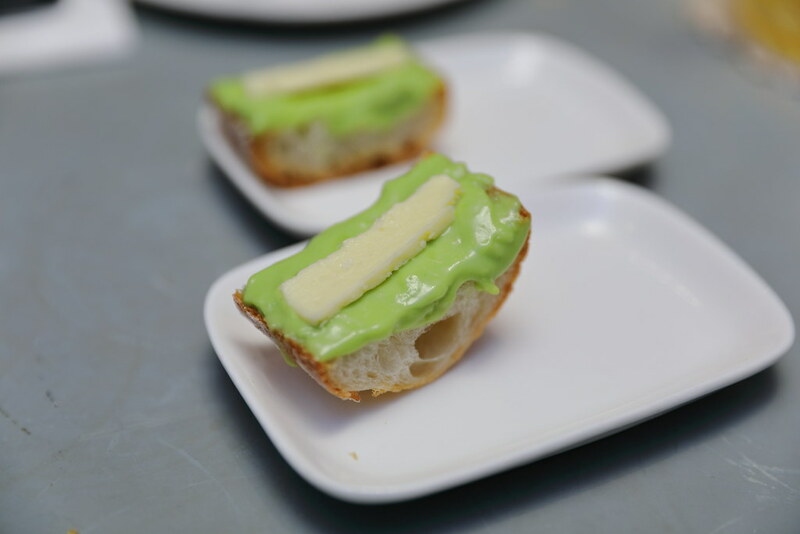 I preferred the hot portion for the delicious pandan kaya spread with butter on toast. I have almost forgotten about this treasured pandan kaya from Antoinette. I am glad that Chef Pang has given life to it, bring it back to the menu again. I always felt inspired by Chef Pang's energy and creativity. He always seemed to be looking out for something new to bring to the table. 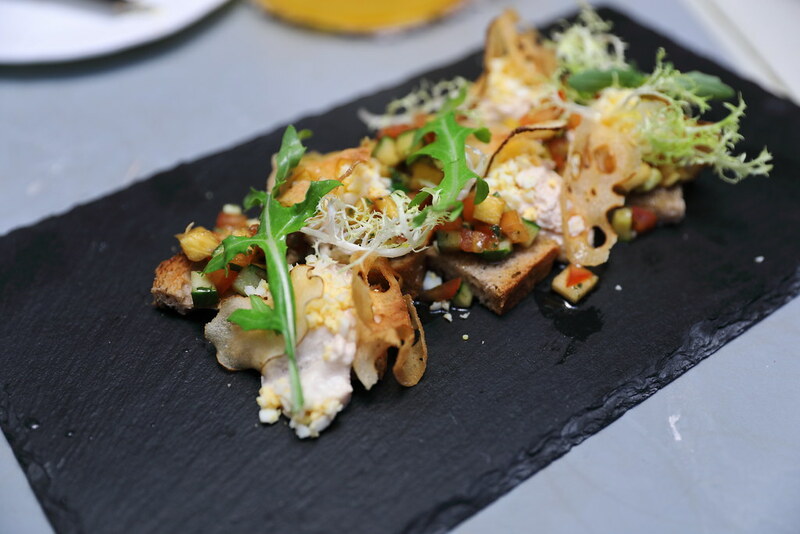 For his heritage menu creation, I would recommend the bread & butter, chicken rice and hakka gnocchi and spaghetti.